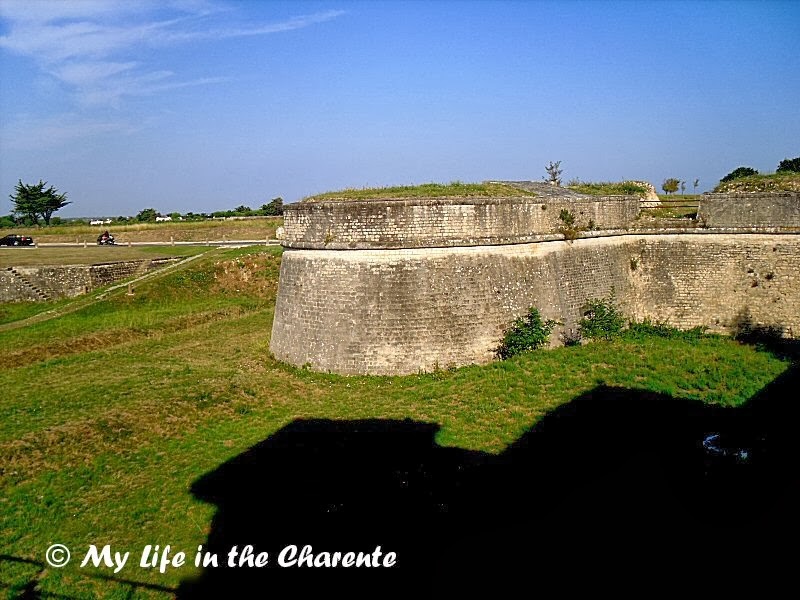 My Life in the Charente: Île de Ré - Part 6, the last of the La Rochelle series! 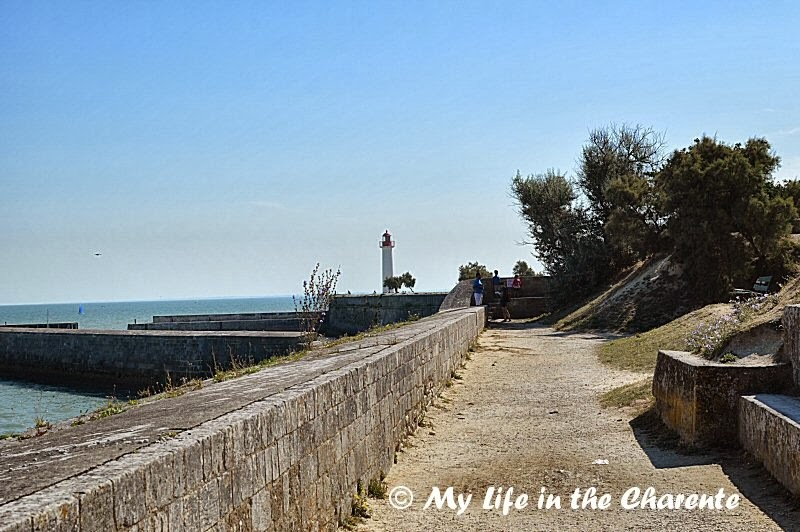 Île de Ré - Part 6, the last of the La Rochelle series! Île de Ré is a large island off the west coast of France. Its southerly neighbour is Ile d'Oleron, but Île de Ré is sited directly opposite the town of La Rochelle. The island's highest point is only 20 metres above sea level; it is 28 kilometres long and 5 kilometres wide and the scenery is a mixture of salt marsh, dunes, vines and forests. A bridge about 4 kilometres long, which was built in 1987, connects the island to mainland France. Vehicles using it must pay a very expensive toll - €18 return for a car ! 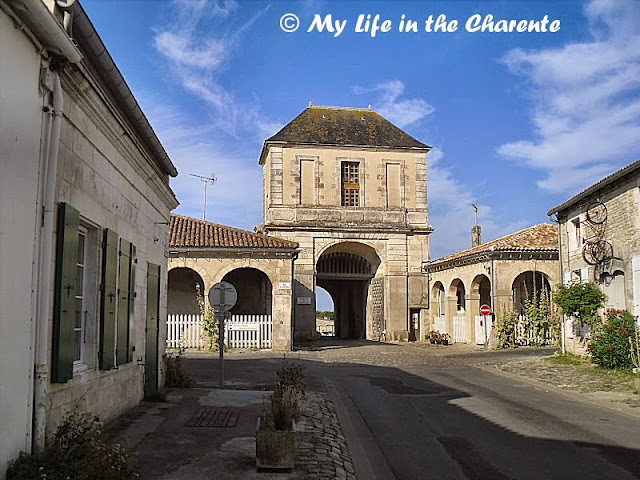 We only had time for a short day visit to the village of St Martin de Re, but the island deserves much more attention, as it is steeped in history. If we had more time, and had been staying overnight, the best plan would have been to cycle around the whole island and take time out to look at the various museums. There are many shops around where you can hire cycles, if you are visiting without your own bikes. Our visit coincided with the end of school holidays, and all roads were very congested with both cars and bikes. The island location is very popular with French holidaymakers, and the pace of life is generally at slow cycling speed! The island became English in 1154, when Alienor d'Aquitaine became queen of England, through her marriage with Henry Plantagenet. The island again became French in 1243, when Henry III of England returned it to Saint Louis. In 1360 however, with the Treaty of Bretigny, Île de Ré briefly became English again, until the 1370s, when it reverted permanently to French sovereignty. 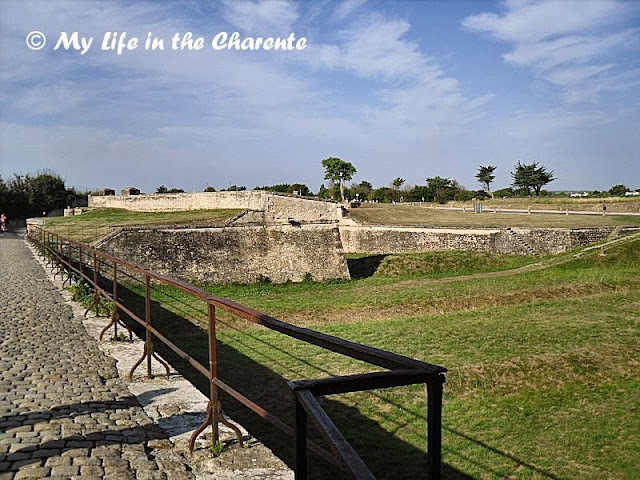 High walls and fortifications remain as evidence of the military past. The island often came under attack from other nations during periods of warfare, of which there were many over the centuries. Thus major fortification works were undertaken to try to defend and protect the island and its citizens. Much of this work was ordered by the "Sun King" Louis XIV in the 17th century. In later times, the buildings were used for the confinement of political prisoners. 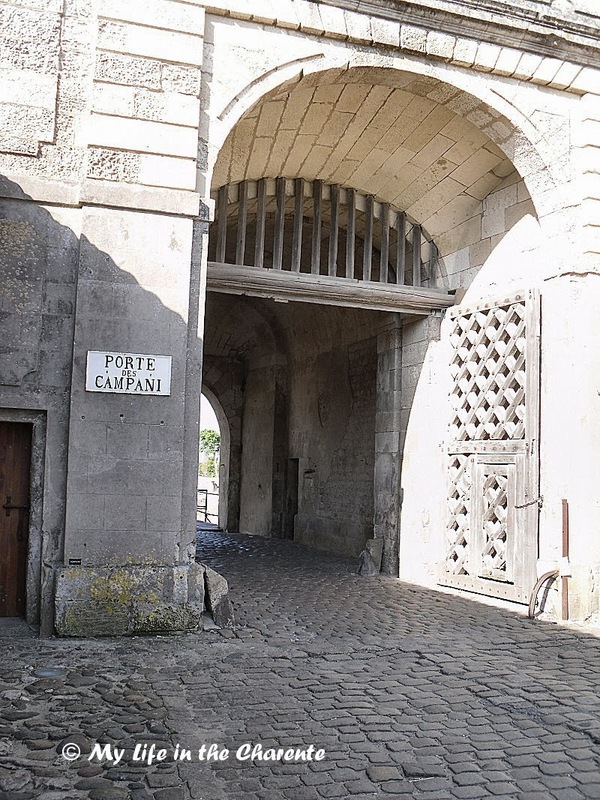 Porte des Campani -one of two entrances to the old walled city. Its cobbled walkways and robust stonework looking now, much as it must have done when it was built over 300 years ago. Quincaillerie or typical hardware shop, seldom found in the UK any more. 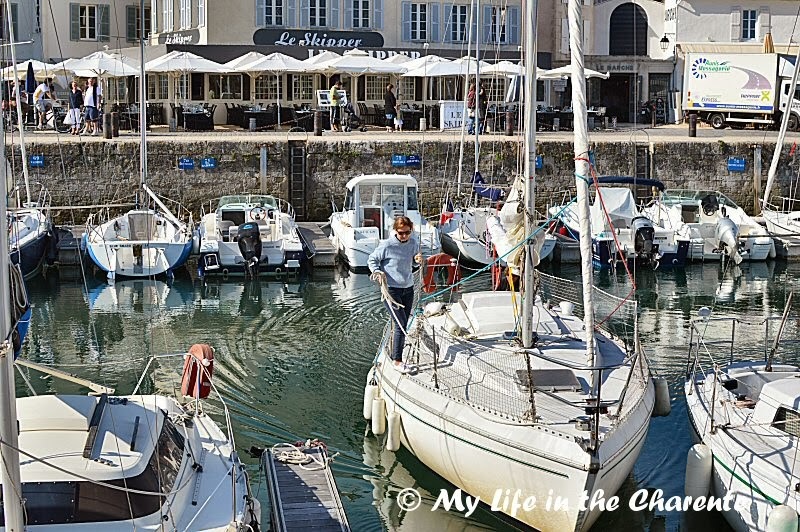 Lunch in delightful sunshine, overlooking the harbour in St Martin de Re, situated on the island's north coast. See below for the view from this terrace! Harbour jam-packed with boats. 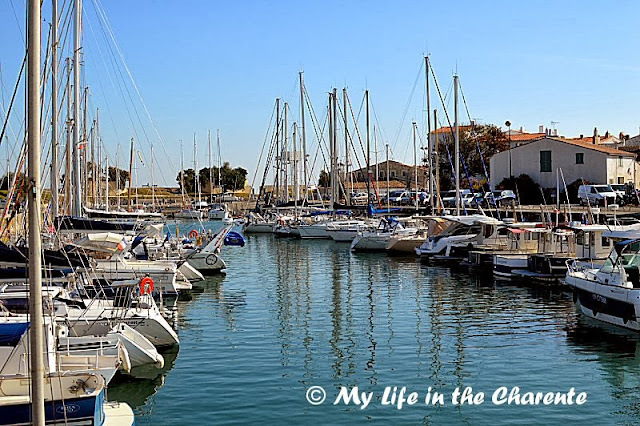 One would have to get on the waiting list for a mooring in this very popular port! Some skilful boat handling required! With the eyes of the people on the crowded quays upon them, no serious manoeuvring errors could be made! We will be in the UK for the month of December staying with my 92 year old FIL. I will pop in when I have time to look at your posts, and if possible I will try to catch up on some posts we should have done during the year!! I will try to keep the photo diary up to to date if possible during this period. i love the bike on the side of the building. such a beautiful place! have a great december and a merry christmas! We've never visited but your photographs and some that Susan and Simon posted have given whetted our appetites. It looks a beautiful place to visit out of the peak holiday times. I have never visited lie de Re but have been to Ile d'Yeu few time and I loved it. Really, really, really love that island! 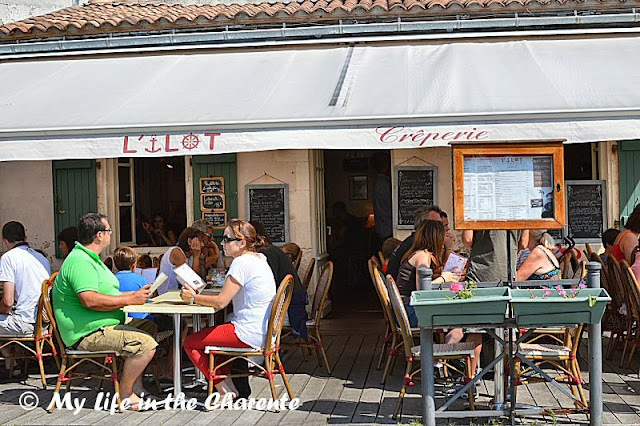 Beautiful beaches and a great "tarte aux pruneaux". I hope it hasn't changed too much. A friend used to go there for picking up 'wild' oysters and took us there a couple of times....wonderful days out! 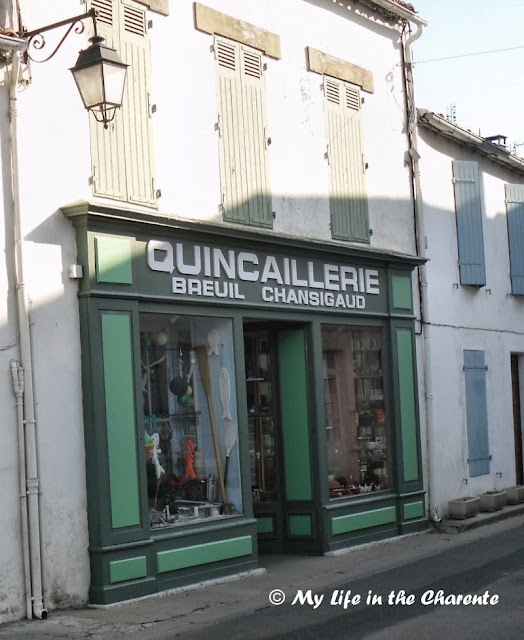 I can't remember if this is the place where the donkeys wear trousers....but I do know that property prices are sky high from all the Parisian holiday homes there. Still, Parisian owned or not, the narrow streets with hollyhocks and valerian lining the wallls are just lovely. Have a good time in the U.K. - and try to keep warm. Fly I do not know about the donkeys, but yes prices are very high, the Parisians love this place and have many holiday homes there. Certainly out of our league!! Will try to keep warm, UK is not our favourite place to travel but it will be good for Nigel to catch up with his family while he can. An amazing place and lots of history. The harbour and marina sure are full of people. Looks like a fantastic place to visit. I am so impressed by the stonework. Not a skill you see used much anymore, at least here in the states. In fact I'm pretty sure most of today's construction won't last 300 years. Have a wonderful holiday. Gosh it is so long since I have been here. I must go back and catch up. (Been baby sitting in LA) This island sure has a colourful history. Lovely place and I enjoyed learning a bit of its history. Thanks so much and happy travels over the holidays. What a lovely but crowded harbour. It must be very popular. I bet it takes some skill to get in and out of a slip there, especially if there is the least bit of wind. What a beautiful area. Have a nice trip to the UK - I hope you enjoy the holidays. Lovely tour, as always! Hope you have a good holiday in the UK. I have thoroughly enjoyed your posts on this lovely region of France, thanks for sharing your trip so comprehensively. I have heard so much about la Rochelle, now I know what it looks like! You make an excellent tourguide Diane, merci beaucoup. It never ceases to amaze me the age of some of the European structures, that look the same today as they did hundreds of years ago. Have a wonderful December with your family, tak care. Sometimes the best way to enjoy life is at a slow cycling speed! Thank you for the beautiful places you show us, many of them I've never even heard of. Thanks JM, It is good that I can come up with places you have not heard of as you are well travelled :-) Have a good weekend Diane. I enjoyed your photo essay, as usual. I've wanted to visit the La Rochelle area but wasn't sure there was much to see there. Your posts have settled that issue for me. This island, which I'd not previously heard of, looks like a lovely place to spend a day. Hi Diane .. I'd love to visit this island .. especially as the pace of life and cycling is slow! Gorgeous photos giving us an inkling of what it looks like - the Eleanor of Aquitaine era is a fascinating time .. but history with its constant changes of ownership is challenging at times and that era - definitely so. Hilary I was sorry that we only had a short trip there, I would love to spend a few days there with our bikes. You advertise France so well, that the number of tourists must have increased a lot. I've really got to get myself onto the Île de Ré if I get the chance to come back that way again. (I'll make sure that I save up enough money first to get across the bridge). One thing puzzles me, though: I'm sure that I was told that everyone on the Île de Ré was famous. I expected at least one picture of a film star. Sorry I am a poor blogger these days!! I have had a look at your latest posts, this west coast is magic, especially seen through your eyes!! Cheers keep well and warm! I have enjoyed your posts on La Rochelle. We also went there for a week and thoroughly enjoyed it. You did see some sites we did not – like churches for example (we are not church goers like most Parisians and forget to go – a shame since some are pretty.) 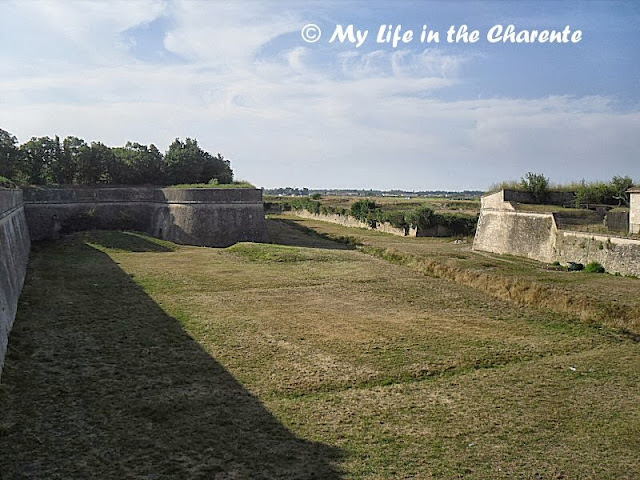 We have never been to l’Ile du Ré, so it was great looking at your pictures, which are very good. It also looked like you had good weather. Here today it has been 76 degrees F (25 C) which is too warm for me in December – I hope we’ll get some cool weather soon. Indeed a lovely place to have lunch Diane. Little places like this are always delightful. It was lovely to see your photos of this charming place. I hope you are enjoying your time in England. It's great you are with your FIL to make his Christmas more cheerful! Merry Christmas! Thanks Joyful, I am glad the my FIL has company for several weeks but oh how we do miss home :-) Hope you have a great Christmas as well Diane. Wow another renaissance beauty that I am afraid I will never get to visit, thanks to you I get to see it virtually! Have a merry Christmas Diane!